Geschichtsphilosophische Reflexionen. Walter Benjamin zum Gedächtnis. Hrsg. von Max Horkheimer und Theodor Wiesengrund-Adorno, Los Angeles 1942. “Über den Begriff der Geschichte,” GS I.2:691–704. Über den Begriff der Geschiclite. Walter Benjamin Werke und Nachlaß Kritische Gesamtausgabe. Band 19. Herausgegeben von Gérard Raulet. Suhrkamp Verlag Berlin 2010 . Theses on the Philosophy of History. In Iluminations. New York: Schocken Books, 1968. On the Concept of History 1940. Benjamin: Selected Writings SW 4: 389-400. Historian käsitteestä. Teoks. Messiaanisen sirpaleita. Suomentanut Rauja Sironen. Kansan Sivistystyön Liitto. Tutkijaliitto 1989, 177-193. 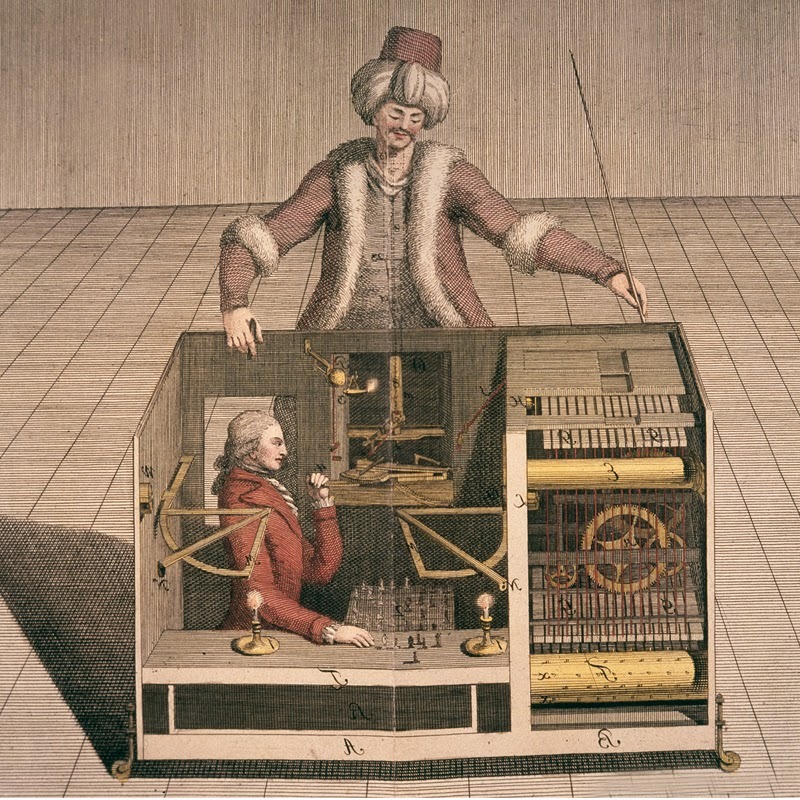 As it is well known there was once an automaton constructed in such a way that it could respond to every move by a chess player with a countermove that would ensure the winning of the game. A puppet wearing Turkish attire and with a hookah in its mouth sat before a chessboard placed on a large table. A system of mirrors created the illusion that this table was transparent on all sides. In truth, a hunchbacked dwarf – a master at chess-play – sat inside and guided the puppet’s hand by means of strings. One can present a philosophic counterpart to this apparatus. The puppet, called ” historical materialism, ” is to win all the time. It can easily be a match for anyone if it enlists the services of theology, which today, as we know, is small and ugly and has to keep out of sight. 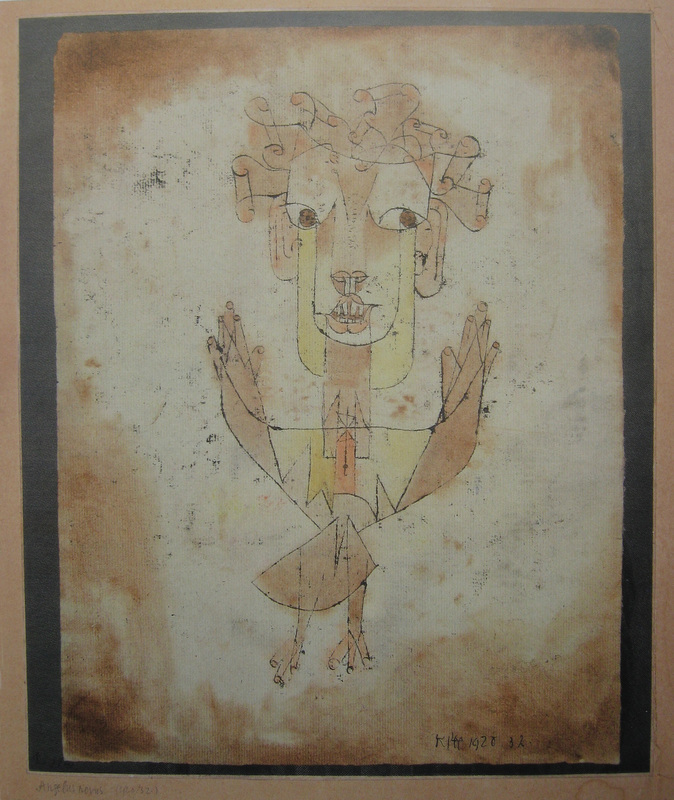 There is a image by Klee called Angelus Novus. It depicts an angel who seems about to move away from something he is staring. His eyes are wide, its mouth is open, his wings are spread. This is how the angel of history must look. His face is turned toward the past. Where a chain of events appears before us, he sees one single catastrophe, which keeps piling wreckage upon wreckage and hurls it at his feet. The angel would like to stay, awaken the dead, and gather together the battered. But a storm is blowing from Paradise and has got caught in his wings and it is so strong that the angel can no longer close them.This storm drives him irresistibly into the future, to which his back is turned, while the pile of ruins before him grows toward the sky. What we call progress is this storm.